Military events and balls often have military wives scrambling to find the dress for an event (sorry, military spouse guys, I can't imagine you have the same angst over which suit to wear!). Prom season is also nearly upon us, which means lots of our military dependents are also looking for that one-of-a-kind formal wear. The longer you’re affiliated with the military, the more ‘events’ you’ll attend. I have a few standbys that I rotate depending on the event, and a little black dress is nearly always appropriate. However, there are some occasions, such as each service’s yearly Ball, that simply require something more formal. 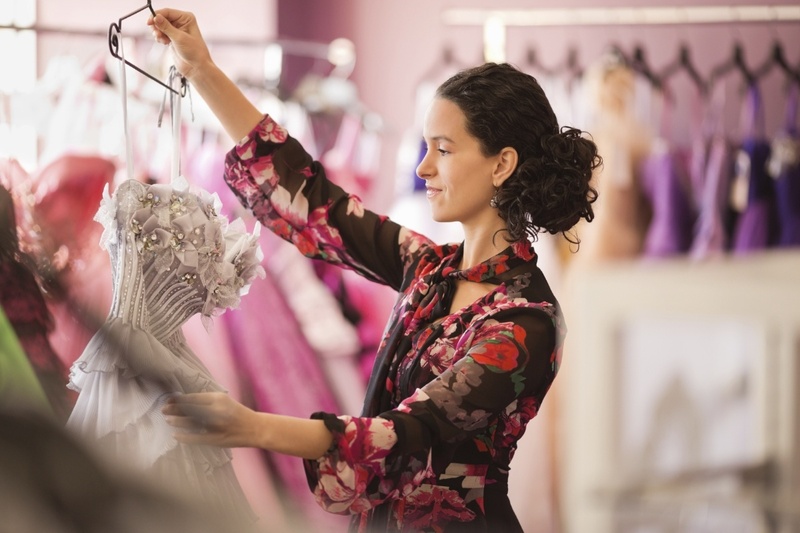 For many young wives who want to attend a formal event, it can be a daunting task to find something appropriate and affordable. Here are a few ideas to help you find a dress worthy of Cinderella without breaking the bank! Military thrift stores: Most military installations operate thrift stores, and you might be surprised what you can find there--everything from dresses to glittery, strappy sandals. So go have a look before you spend a wad! Also don’t neglect your local consignment stores. There are lots of treasures there, and you won’t feel bad about buying something you may only wear once. Cinderella’s Closet: Many installations, including the one where I live, have set up some version of a “Cinderella’s Closet,” loaning out gently used formalwear often along with purses, shoes, and accessories. Usually, these are loaned out for free, requiring only a cleaning before return. Also check out your local Cinderella’s Closet off-base if you have one. These often give away dresses to keep and may require a referral. Garage sales: I've seen formals at garage sales, so if you have time for the hunt, this may turn up some great finds! Department store markdowns: There are great deals to be had at large department stores clearance racks, especially if you plan ahead and buy dresses when you find them at a good price vs. waiting until the last minute. I found a lovely gown at Nordstrom’s for 1/3 the cost of its original price. Along with that, they threw in free alterations, since it was the only one they had left in my size. So, check the sales racks! You never know what you might find. My policy is to go ahead and snap it up if I see something I can use later at a great price, even if it's out of season. It saves me from last-minute stress shopping where I wind up paying way more than I'd intended! Online: You can often find amazing deals at online retailers, if time is on your side. Ebay has a great guide to finding an affordable formal. I've also heard of some having good luck with services such as Rent the Runway, an online dress rental service. Borrow or set up a dress exchange. At one base we were stationed, several military spouses sponsored a dress exchange. They ensured several of each size were represented and all met together one evening to have dinner, talk, and swap formals. Fun! The deal was you let someone borrow (or keep, if you were tired of it!) your gown; you borrowed theirs. Get creative, and don’t avoid military formal events because you don’t think you can find something to wear. The pomp, ceremony, traditions, and fun are something you should experience at least once! Share your tips for finding a dress that helps you feel like Cinderella!